Remember a while back I made a beautiful winter wreath from an old horse harness? You can check it out here. I used horseshoes as part of the decoration for the wreath and I had a few extras. I also had a rescued chunk of rough sawn wood, that I saved from our burn pile. 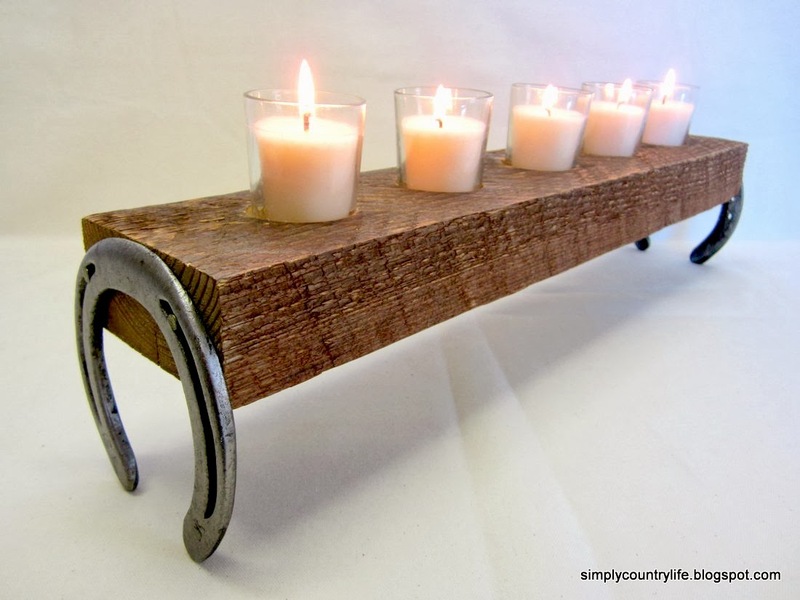 I knew that I wanted to make the wood piece into a candle holder, but the idea to add the horseshoes came when I laid the chunk of wood on the counter in my workshop next to the box of extra horseshoes. The chunk of wood and the horseshoes got a good cleaning to start. then added five votive candles. as a centrepiece at a rustic, country wedding. It is also a great size for a mantle. I'd say they got a new life! This is such a pretty project! This would look so fabulous in a log cabin. Oh, wait.... LOL! It would be perfect on your mantle! So creative. Oh My goshI LOVE this!!!!!!!! Please come share this on a party I cohost DIY Sunday Showcase! It opens today at 5!!! I would really like to pin this one to our talent board!! Hope to see you there! Shelly, thank you so much for the compliment and the invite. I'll be sure to drop by! Thanks for coming over and sharing with us! It's pinned to our talent board! Love the idea. But, I'm of the belief that a horseshoe in this direction is bad luck and the horseshoes ought to be turned the other way. What did you use to drill the actually hole? a holesaw? I used a large drill bit. Hope this helps. 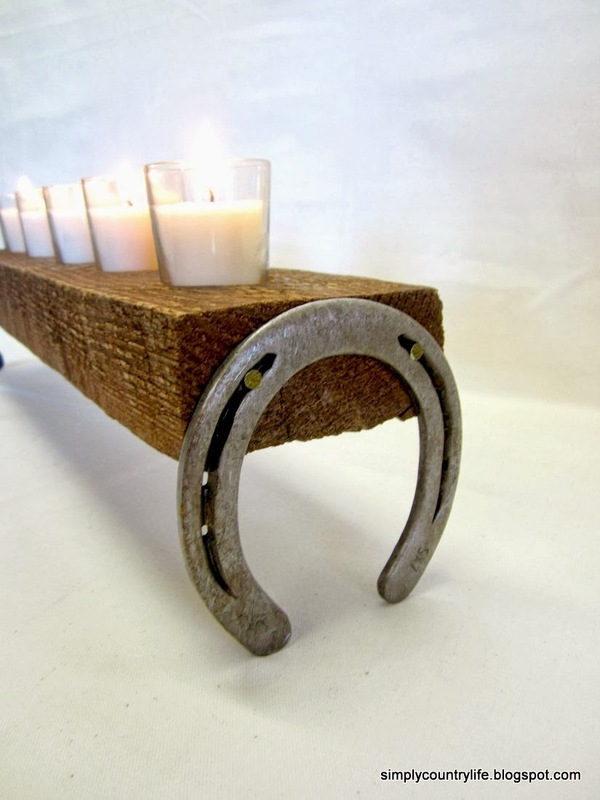 That's genuinely beautiful - I might even buy new horseshoes and make it (even though that's sort of cheating). Thanks for the great post! what are the sizes of the horse shoes? 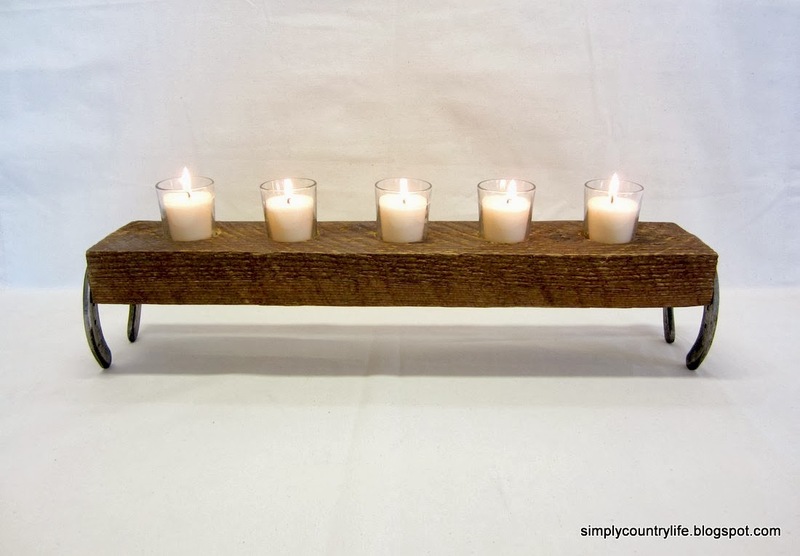 How did you get the holes for the candles? This diy project is wonderful.